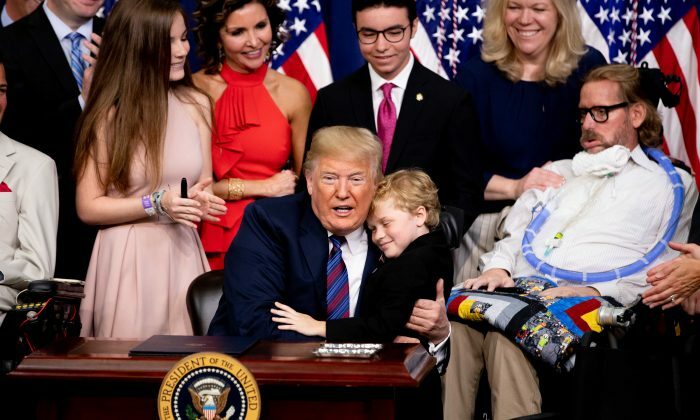 President Donald Trump signed the Right to Try Act into law at the White House Wednesday. The law allows terminally ill patients to try experimental treatments not currently approved by the Food and Drug Administration. Trump endorsed the Right to Try Act during his State of the Union Speech earlier this year. “People who are terminally ill should not have to go from country to country to seek a cure,” Trump said in January. “I want to give them a chance right here at home. It’s time for Congress to give these wonderful, incredible Americans the right to try. The Senate approved the bill unanimously in August last year and it cleared Congress by a 250-169 vote in late May. The law lets patients with terminal illnesses try experimental drugs that have passed the first phase of the FDA approval process. This means the drugs have undergone early testing on humans. Patients will have to have tried approved medications first before trying experimental drugs. And once they’ve begun using experimental medicine, patients would have to be continually evaluated. “Terminally ill patients and their families now have more freedom and more hope!” Senator Ron Johnson wrote on Twitter after the bill signing. Proponents have called for a federal Right to Try law for years, but with little success. Trump said that when he was presented with two versions of the bill, he asked for the one that would put the interests of the people before the interests of insurance and pharmaceutical companies. The president pointed out that it takes up to 15 years to approve new drugs. “And we’re moving that timeline way up anyway, beyond this. We’re moving it way up,” the president added.